« What’s New At Your Valrico Dentist Office? At Five Star Dental Care we see many Brandon FL area children and teens with serious mouth and tooth injuries that could have been prevented had they been wearing a mouthguard. When a tooth is knocked out or broken, speaking, eating, and smiling can become very difficult. I am Dr. Jeff Bynum and I recommend that Valrico parents encourage their children to wear mouthguards when participating in team sports, skateboarding, skiing, and ice skating. 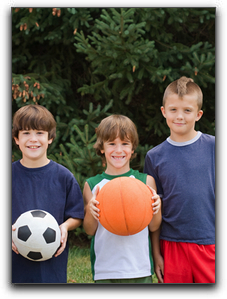 Ask us about mouthguards that will fit your child perfectly and offer excellent protection. Stock mouthguards found at most local sporting goods stores are also an option, they just might not fit as well. If you or your child is in need of cosmetic dentistry due to an injury or an accident, my staff and I at Five Star Dental Care in Valrico offer many restorative options. If the tooth is cracked, porcelain veneers may be an option. This procedure is done by bonding a custom-fitted porcelain veneer to your tooth or teeth. This can cover a crack, chip, or discoloration. Cosmetic bonding is also an option for a chipped or cracked tooth. A composite material is matched to your tooth color and then sculpted around your existing tooth to repair the crack or chip. This procedure is less expensive than veneers and gives beautiful results. If a crown or dental implant is required to repair your tooth, my staff and I at Five Star Dental Care will provide quality crowns made from high-strength ceramic or porcelain with beautiful shape, color, and translucency. Five Star Dental Care has been offering family and cosmetic dentistry as well as emergency dental care to the people of Florida since 1996. My staff and I would love to serve you and your family. We invite you to contact us today to schedule a consultation. We are located at: 3203 Lithia Pinecrest Rd, Valrico, FL 33596. This entry was posted on Friday, March 8th, 2013 at 10:48 am	and is filed under Cosmetic Dentistry, General Dentistry. You can follow any responses to this entry through the RSS 2.0 feed. Both comments and pings are currently closed.